St. Lawrence Seaway cargo volumes are up 10 percent as the shipping season enters its busiest final months. According to The St. Lawrence Seaway Management Corporation, total cargo tonnage from March 20 to October 31 reached 28.7 million metric tons – 2.5 million metric tons more compared to the same period in 2016. “The star performers this year have been North American mined products such as iron ore and salt and high-value goods such as specialty steel imported from Europe,” said Terence Bowles, President and CEO of The St. Lawrence Seaway Management Corporation. The U.S. Saint Lawrence Seaway Development Corporation (SLSDC) and the Canadian St. Lawrence Seaway Management Corporation have jointly marked the opening of the Seaway’s 59th navigation season. The official opening ceremony of the binational waterway took place on March 20 at the St. Lambert Lock in Montreal with Canadian Transport Minister Marc Garneau attending as honored guest and SLSMC President and CEO Terence Bowles and SLSDC Deputy Administrator Craig H. Middlebrook addressing the gathering. “The Great Lakes St.
After opening the 2016 season on March 21, the St. Lawrence Seaway closed on December 31, enjoying a navigation season of 286 days. This performance ties the record first established in 2008 and matched in 2013 for the longest navigation season. 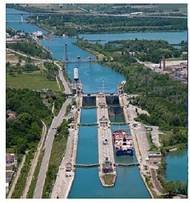 The St. Lawrence Seaway Management Corporation recorded a total of 35 million tonnes of cargo transiting the Seaway’s locks in 2016. Grain movements posted a strong performance for a third consecutive season, contributing 11 million tonnes of the total and continuing to track well above the five-year average. 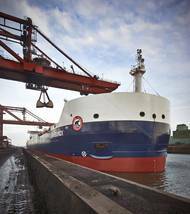 The Seaway concluded the 2014 navigation season with 40 million tonnes of cargo, which represents a full recovery from the 2009 global financial crisis and its ensuing aftermath. The St. Lawrence Seaway Management Corporation (SLSMC) announced today that the Seaway closed for the season on January 1, 2015, with the eastbound vessel Sten Bergen transiting the St. Lambert Lock in Montreal at 00:22 a.m. The last vessel to exit the Welland Canal was the Algoma Navigator at 8:00 a.m. on December 31. St. The St. Lawrence Seaway Management Corporation (SLSMC) announced that it has reached agreement with UNIFOR, which represents the corporation’s 460 unionized employees, on Sunday evening to refer certain important issues to binding arbitration, also suspending the right to strike or lockout, ensuring that shippers will encounter uninterrupted navigation until March 31, 2018. The St. Lawrence Seaway Management Corporation (SLSMC) announced that Tim Dool has been named as Chair of the Board of Directors, effective September 1. Dool was appointed to the Board in November of 2012, and represents domestic carriers. As the former President and CEO of Algoma Central Corporation, he brings an extensive range of marine industry experience to the boardroom table. Dool succeeds Jonathan Bamberger, who has completed a two year term as Chair of the Board. Bamberger, President of Redpath Sugar, will continue to serve as a member of the Board. The Canadian St. Lawrence Seaway Management Corporation (SLSMC) increase tolls 3% for 2013 season. 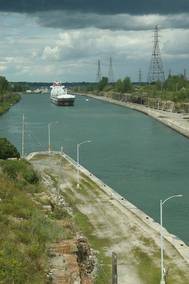 There are no tolls charged for transiting the U.S. section of the Seaway's lock system which is operated by the U.S. Saint Lawrence Seaway Development Corporation. More than 39 million metric tonnes of cargo transited the Seaway during the 2012 navigation season which represented a 4 percent increase in cargo volume. The increase in cargo tonnage reflects the modest economic recovery taking place within the Seaway’s client base and the emergence of new trade patterns. The St. Lawrence Seaway Management Corporation (SLSMC) is pleased to announce that Mr. Georges Robichon and Mr. Tim Dool have each been appointed to its Board for a three-year term. Mr. Robichon replaced Mr. Paul Gourdeau as the international carrier representative in August, while Mr. Dool becomes the domestic carrier representative when Mr. Ian MacGregor’s term is over at the end of November. In addition, Mr. Jonathan Bamberger was named Chair of the Board of Directors effective September 1st. He is President of Redpath Sugar Ltd. and has been a member of the SLSMC’s Board since August 2010. The St. Lawrence Seaway closed for the season on December 30, 2011, with the westbound vessel Algoma Spirit reaching Lake Ontario at 7:54 a.m. after having transited the locks on the St. Lawrence River. The Seaway’s 53rd navigation season commenced on March 22nd, and the system remained open for a record 284 days, exceeding by one day the previous record set in 2006. The tug / barge combination John Spence / Niagara Spirit was the last vessel to transit the Welland Canal, clearing Port Colborne December 30th at 8:26 p.m. on its way to Lake Erie. The St. Cargo shipments to ports on the Great Lakes and St. Lawrence Seaway navigation system generate $34.6 billion of economic activity and 227,000 jobs in Canada and the U.S., according to a new study released today. That breaks down to 98,000 jobs and $15.9 billion in economic activity in Ontario and Quebec. The study, which is the first to reveal the economic value of the entire bi-national Great Lakes-Seaway System and its more than 100 ports, was simultaneously unveiled today by the Canadian St. Lawrence Seaway Management Corporation in Ottawa and by U.S.